Translation... We're off to Spain! Opportunities present themselves, but it’s up to us to take them. Take Spain, for example. And we did!! As I’ve said, my bucket list dream is to see - really see - the 50 states. So vacation plans don’t have me looking at travel across the big pond. However, my youngest son has been in Spain since the beginning of January, doing a semester abroad. He says, “Why don’t you come visit me Mom?” He can’t be serious. I haven’t been to California, or Washington, or Texas. What about Montana? Then I had to have some surgery. Sitting at home, recuperating one night, I was just peeking online at flights, you know, not really planning on going, but well... And there it was, the flight of a lifetime. I checked our reward points, and OMG!! We could fly round trip to Spain for Next. To. Nothing! Opportunity presenting itself. We took it!! What a great time. Speaking essentially no useful amount of Spanish, it was great to be met by our son at the Madrid airport. We were thankful to have Nick as our tour guide for the first few days, and then we were on our own. What an adventure! We walked all over Madrid, and took the Metro system too, which was so easy to use. The Palacio Real de Madrid, Reina Sofía National Art Museum, the Prado, Puerto del Sol. 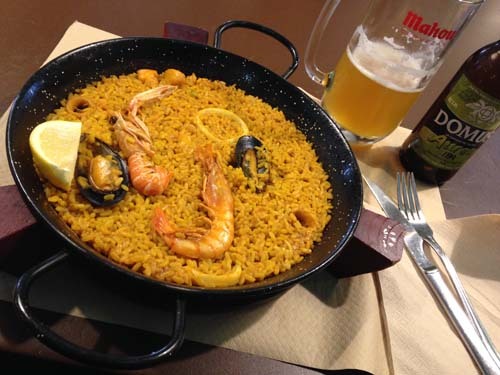 Mercado de San Miguel, sangrias, paella. We took the bus on day trips - Segovia, Toledo, Ávila. Gradually we picked up necessary Spanish words - no hablo Español, salida, and most importantly, aseo por favor. And it was fun, like being on a treasure hunt, listening for a word in a conversation that you might understand. Segovia, Tim’s favorite, is famous for it’s 1st century Roman aqueduct. Like nothing we have ever seen before, this granite block aqueduct is truly an architectural masterpiece. (The US wasn’t even the US until 17 centuries later!) We walked to the end of it, which is a tiny fraction of its original 14 kilometer length. We just had to see how the water ran through the trough. The Alcazar of Segovia, built in 1122, was massive. How did they build these places? While dining on suckling pig in the Plaza de Mayor, we were witnesses to a wedding complete with authentic Spanish dancing. Toledo was my favorite. Having never been to Europe, I was like a kid in a maze wandering through the narrow winding streets. Toledo is the “City of the Three Cultures.” Muslims, Jews and Christians have all lived here, side by side. Nice. The Cathedral of Toledo was stunning! Spain really knows how to do it’s churches! Ávila is home of the Walls of Ávila, begun in 1090 AD. The best preserved walls in all of Europe and you can walk on them. We walked where Romans walked! Ávila is also the birthplace of Teresa de Ávila, a Roman Catholic Saint. We met Nick’s host mother, Puri, and she invited us to dinner. Nick had to translate for us, Puri doesn’t speak English. She made great Spanish dishes, including a chicken stew. She and Nick had a great laugh when I asked for more polla por favor! Soon it was time to say adiós. We shared hugs, an American Mother and an Español Madré. Opportunities present themselves daily. Which one will you answer, and what adventures await you? Looking back to see our future. It's been said that imitation is the greatest form of flattery.